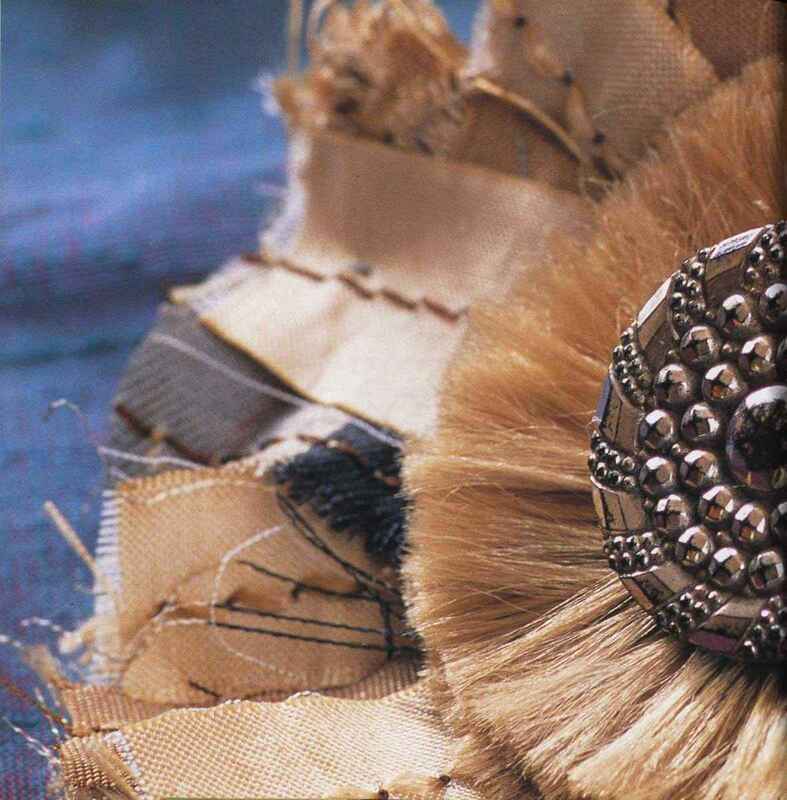 ■ Thimble has been used to create a neckpiece that is embellished further with toning buttons. This neckpiece would also be charming made from a selection of vintage fabrics and buttons, echoing its patchwork origins. 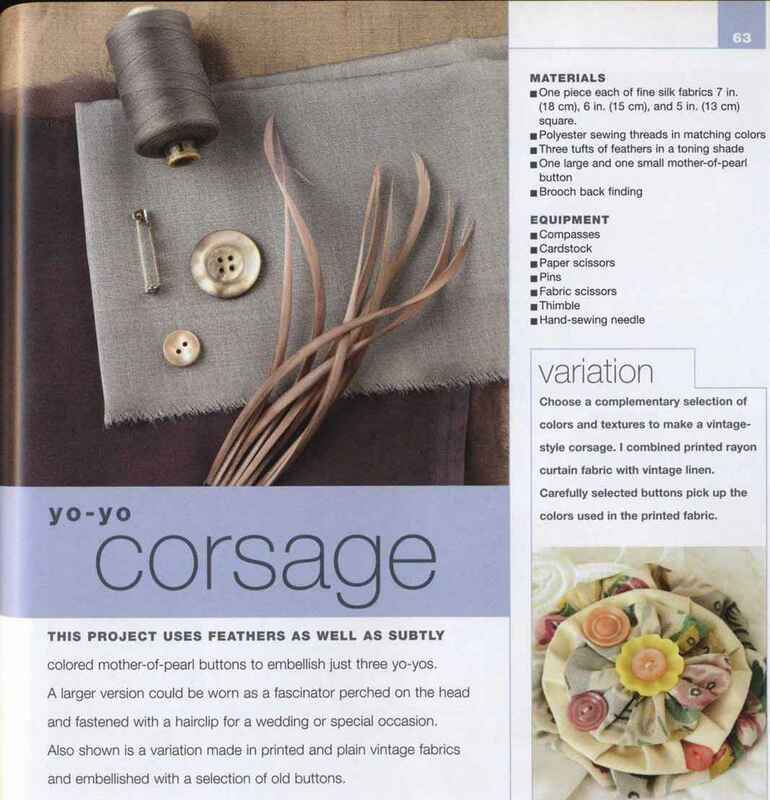 If you would like to begin with a less ambitious project, make three yo-yos into a vintage-style corsage (see page 63). 1 Using the compasses, draw circles on the cardstock with the following radiuses: size 1, 3'A in. (9 cm); size 2, 2% in. (7 cm); size 3, 2 in. (5 cm); size 4, 1A in. (4 cm). Cut out the cardstock templates with the paper scissors and pin them on the fabrics. Cut out the following circles of fabric, making sure you have a balanced amount of each fabric color: size 1, cut three; size 2, cut eight; size 3, cut 15; size 4, cut 17. You may wish to fold the fabrics into two or four layers and cut out several circles at the same time. 2 Using the hand-sewing needle and doubled polyester sewing thread, sew a line of running stitches around the edge of each circle, about % in. (5 mm) in from the edge. 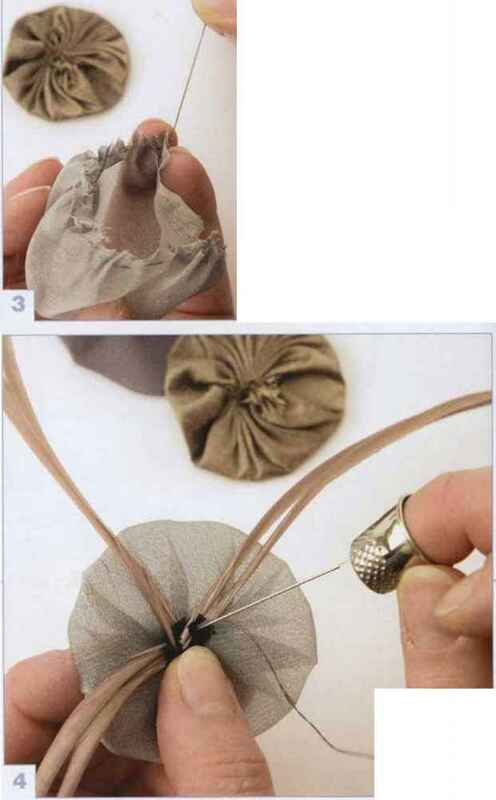 Pull the threads up tightly to create yo-yo shapes. Secure the threads with several oversewing stitches. 3 Build the yo-yos into groups of two and three as follows: three groups consisting of one each of sizes 1, 2, and 3; five groups consisting of one each of sizes 2, 3, and 4; six groups consisting of one each of sizes 3 and 4. You should have six very small yo-yos left over. 4 Lay out the yo-yos in a circular arrangement with more toward the bottom. If you have a dressmaking mannequin, it is useful to pin the yo-yos around the neck to assess your composition. 5 Hand-sew the edges of the yo-yos together with a few small but secure oversewing stitches, following the arrangement set out in Step 4. (12 mm x 10 cm) along the selvedge of one of the fabrics. Fold it along its length into three, so that the selvedge is outmost. Overstitch along the edge with polyester sewing thread. 7 Sew the large button to the center of the last yo-yo on one side. Fold the strip in half and sew the ends to the back of the last yo-yo on the other side, adjusting the length as necessary to accommodate the button. 8 Finally, decorate the center of each yo-yo by sewing on a button. By leaving this until last you can judge exactly how to arrange the buttons to best effect. ■ One piece each of fine silk fabrics 7 in. (18 cm), 6 in. (15 cm), and 5 in. (13 cm) square. 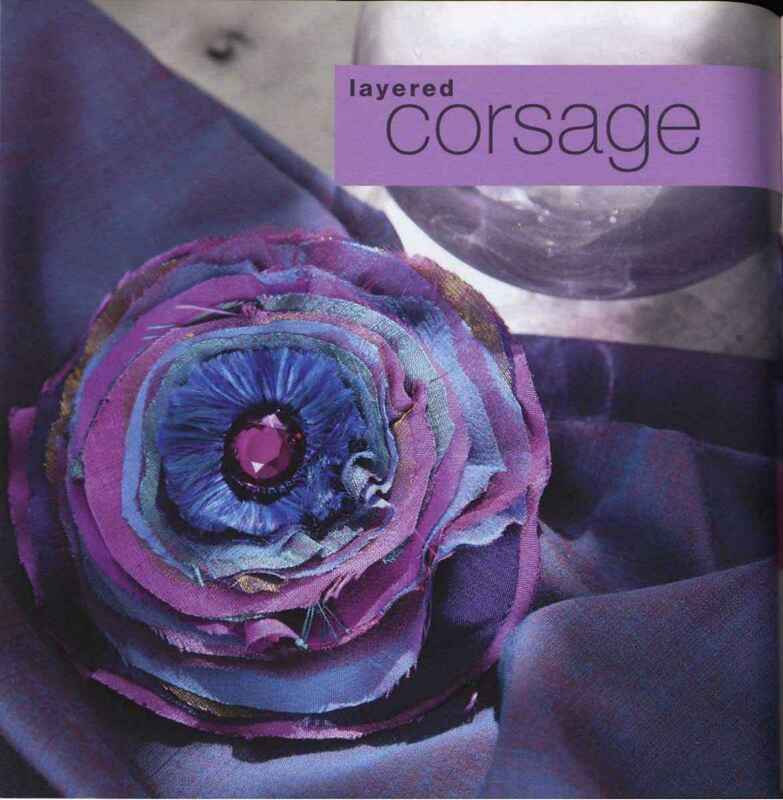 Choose a complementary selection of colors and textures to make a vintage-style corsage. I combined printed rayon curtain fabric with vintage linen. Carefully selected buttons pick up the colors used in the printed fabric. this project uses feathers as well as subtly colored mother-of-pearl buttons to embellish just three yo-yos. A larger version could be worn as a fascinator perched on the head and fastened with a hairclip for a wedding or special occasion. Also shown is a variation made in printed and plain vintage fabrics and embellished with a selection of old buttons. 3% in. (8 cm), 2% in. (6.5 cm), and 2 in. (5 cm.) Cut out the cardstock templates with the paper scissors. 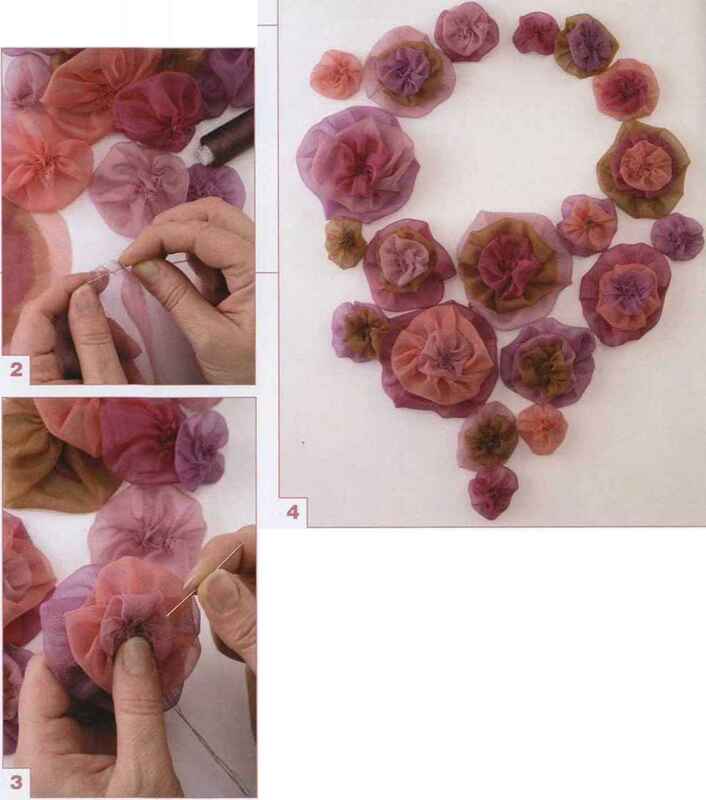 Pin them onto the fabrics and cut out one circle of each size with fabric scissors. 2 Using the hand-sewing needle and doubled polyester sewing thread, sew a line of running stitches around the edge of each circle, approximately % in. (5 mm) in from the edge. 3 Pull up the threads tightly to create a yo-yo shape. Secure the threads with several oversewing stitches. 4 Turn over the middle-sized yo-yo and sew the feathers onto the back of it, checking that they form a pleasing arrangement from the front. 5 Place the middle-sized yo-yo on top of the largest one. 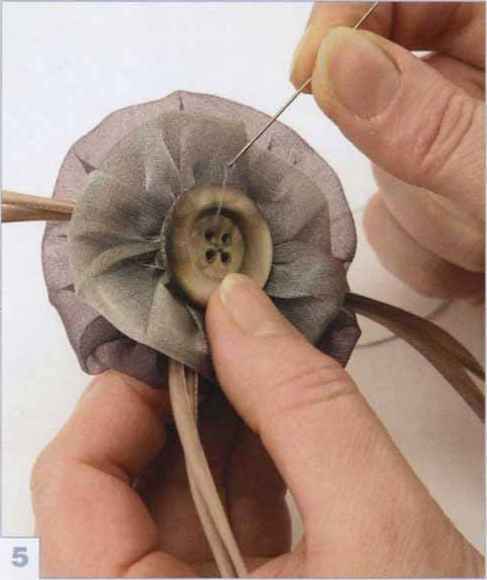 Place the larger button in the center and sew the yo-yos and the button together with several firm stitches. 6 Sew the remaining button to the center of the smallest yo-yo. Sew the small yo-yo to the side of the largest yo-yo, overlapping the edges. Ensure that the stitches do not show on the front of the work. 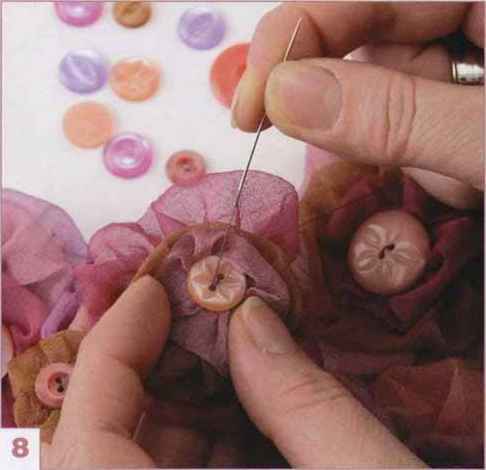 7 Using doubled thread and firm stitches, sew the brooch back finding to the back of the corsage. 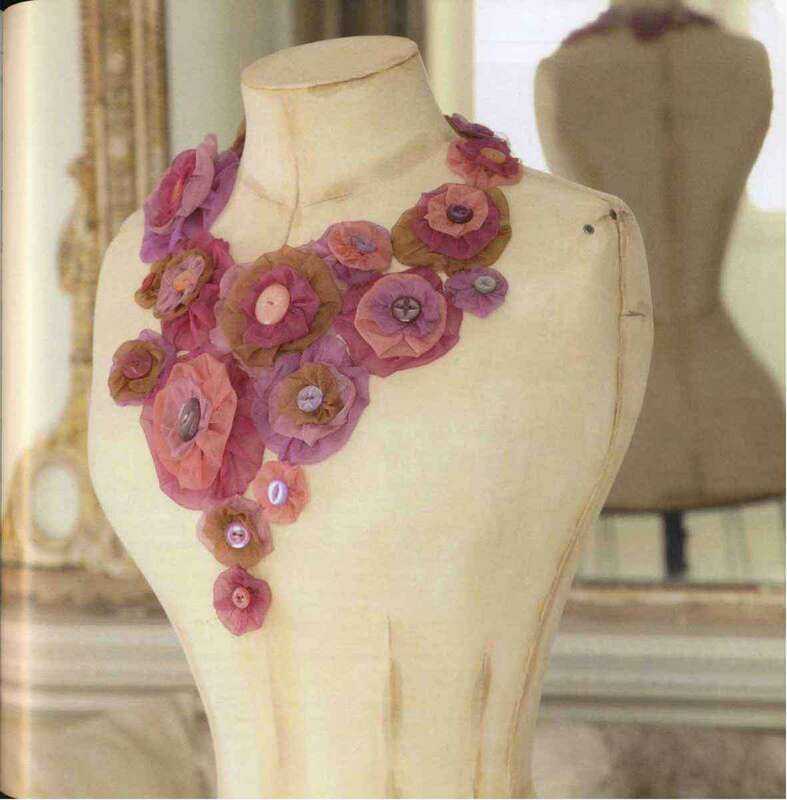 this delicate corsage is made by layering and then cutting back fine silk fabrics. 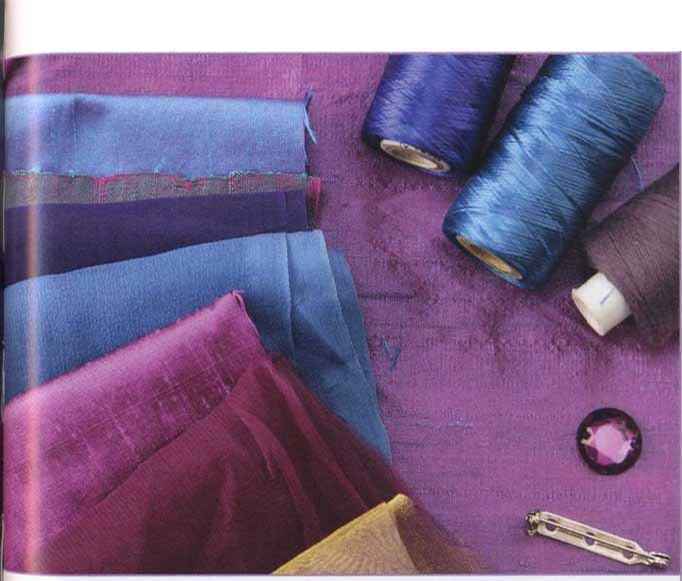 Fabrics with differing textures, such as chiffons, organzas, habotai, and dupioni silks, are all appropriate. 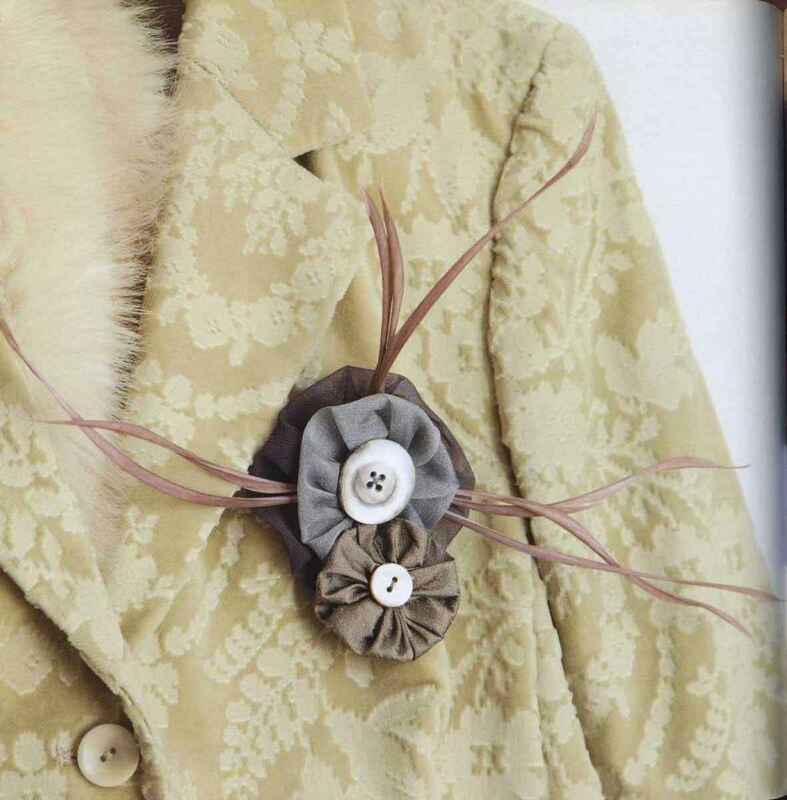 The center features a round tassel and a jewel, but you could use a single gorgeous button instead if you prefer.